Equally famous for his masterful canvasses and tumultuous mental health, Amedeo Modigliani (1884-1920) was, in many ways, the prototypical tortured artist. A lifelong sufferer of painfully degenerative tuberculosis, Modigliani was famous for denying his disease with a frenzied bohemian lifestyle of hard drinking, drug abuse, and passionate love affairs. But at the same time, he managed to produce some of the modern movement’s most enduring masterpieces, and today his work sells for record-breaking sums whenever it comes up for auction. 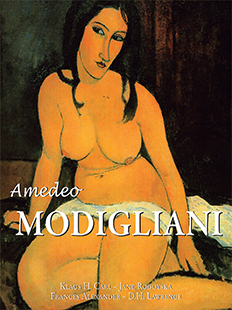 In this fascinating examination of Modigliani’s life and works, Klaus H. Carl, Frances Alexander, and Jane Rogoyska turn their penetrating gaze on this most enigmatic of artistic geniuses. Their insightful text is accompanied by extracts from D.H. Lawrence’s highly sensual novel Lady Chatterley’s Lover, chosen to complement Modigliani’s art and to give a new perspective to it.